A sometimes overlooked source of helpful reading on the ministry are those volumes designed to tell us about the great preachers of the past. While much can be taught about the ministry, there is an element that is caught. I suggest we do our catching at the hands of the masters of the ministry. There are volumes of varying depth and detail that between their covers tell us about many of these preachers. I will review three here and tell you of some others you might look for. Wiersbe was a well-read preacher who was passionate about the ministry, great preachers, and reading. He is said to have 1000 volumes in the biography section of his library alone! This book is a collection of articles he wrote in the 1970s ( the precursor of blogs I suppose). Part 1 tells us of 19 of the greatest preachers ever. You will find Alexander Maclaren, Joseph Parker, Charles Spurgeon, Campbell Morgan, J.D. Jones, and George Morrison among others. Most of my favorites are there. These chapters are exceptional and may start you down the road of finding and reading the preachers who will most move you. That’s not all. Part 2 will fascinate you as well as help you. He turns his attention to books. Several chapters cover preaching and other appropriate subjects. I don’t know about you, but I find myself often agreeing with his assessments. This is a treasure trove and a book I have returned to again and again. 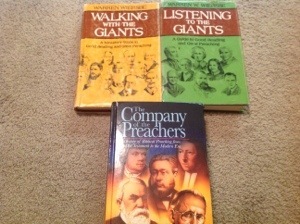 A sequel to his Walking With The Giants that continues his helpful work. Thirteen preachers are discussed, this time with an included sermon. Not quite as famous as those in the earlier volume, but well worth knowing. Part 2 is the best part of this book and will serve as an excellent guide to building a quality library. You will find books on parables and miracles and other subjects. His chapter “A Basic Library” is alone worth the price of the book. It was my first guide when I began assembling my own library. I was not disappointed in following his suggestions. Every preacher should own and peruse this volume. Its scope is wide and its depth amazing. Every preacher who left writings that have made real impact is included. He writes from the Old Testament to the present day and you can see where your favorite preacher fits in the scheme of things. 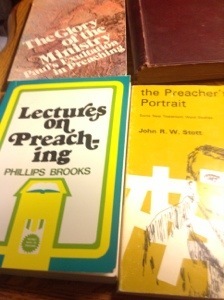 How did one man read so much and learn about all of these preachers! If you find a preacher you really like, be sure to read his footnotes. I hardly know how to describe this book–it is one of my very favorite books! If you find that you really like these types of volumes (as I do), then you can add some other helpful volumes to your library. Look for A History of Preaching by F.R. Webber in three volumes. Then there is the 2-volume set by Edwin Dargin called too A History of Preaching. Ralph Turnbull added Volume 3 to bring the set up to date. After that you can these enjoyable volumes: Princes of the Church by W. Robertson Nicoll, Princes of the Modern Pulpit by Earnest Jeffs, The Best I Remenber by Arthur Porritt, and Nine Great Preachers by Albert Currier, The Scottish Pulpit by William Taylor, Princes of the Christian Pulpit and Pastorate by Harry Howard, and Preachers I Have Heard by Alexander Gammie. These are all 5-star volumes! You might like The Wycliffe Handbook Preaching and Preachers by Wiersbe and Perry as well as Ed Reese’s Chronological Encyclopedia of Christian Biography. All these volumes have helped and blessed me. Searching used book sites will be required to secure several of these volumes, but they are worth all necessary effort. You can find all posts and books reviewed in this series here. There’s no doubt that the world has given men the wrong idea of what they should be. To help combat that on a really practical and biblical level, Mr. Jason Hardin has given us this fine volume “equipping men with integrity for spiritual warfare.” While on some level this book would appeal to any serious believer, it is geared to men. It works hand in hand with some recent literature by men like John Eldredge and Stephen Arterburn that has challenged and helped Christian men. It views the great challenges of life in the context of being a man. Part One addresses the big picture and what a man with integrity looks like. Part Two, my favorite, discusses what must be dealt with to be such a man. The issues are in an order that especially makes sense for men–selfishness, sexual immorality, idolatry, jealousy, anger, sins of the tongue, and hypocrisy. I felt convicted in every chapter, and as he hoped, challenged. I thought the chapter on selfishness was exceptionally well done. Part Three offers the strong enticement to put on the Lord’s armory. It was the perfect climax for such a book. The book looks sharp and can help newer Christians while still being profitable for seasoned ones. I applaud any effort to reach men, which is such a need in our day. I pray this volume can help many! I recommend it! I came home to a surprise the other day! Alicia said, among other reports of the day, that she had written a song. We had somewhere to go that evening, but I asked that she please sing it to me. She and the older children had already worked on it till they could sing it, so she grabbed the guitar while I sat down with my supper. Then I was blown away! Tears had to be fought away just like I learned that Alicia and the children old enough to comprehend it had to do earlier in the day. Praise God, I have Jesus! I told her, after several gushy statements, that this would have to be the new Reagan family theme song. It speaks so to where we are in our journey. All that matters is that we have Jesus! Verse one particularly captures how we feel. We have lived every syllable of it. We learned of the shaky ground of life, of health, of love you could depend on, yet we came out in a wonderful place–safely with Jesus! Since Alicia suffered the lowest depths of it, no wonder she wrote this from an overflowing heart. She saw it before we did. Now, we do too. I asked her if I could have the thrill of introducing this song, and she graciously consented. Forgive me for carrying on, but this song has touched my heart. Alicia has written songs off and on for almost 20 years, but this is easily her best. 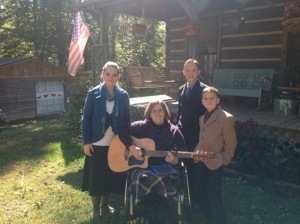 She has written some songs with her prolific songwriting sister Niki Lott, who has Christian Compositions. Those who went to college with her probably know of her Trust In Me and My Grace Is Sufficient, but life’s experiences have given her a richer vein to mine from as you can detect in the words of this song. There is one thing that won’t depart. I have Jesus, and He is all I need. I need Thee every hour…. Sometimes there are volumes that are really good that don’t become as immortal as some others. That doesn’t mean that they aren’t of real value. Here are volumes of varying fame that are all of value to one who handles the Word of God. All easy to find on used book sites, you might find some books here to bless you. The subtitle says “A Passionate Call For Expository Preaching” and accurately describes a book whose message is so critically needed. Mr. Lawson makes a powerful case for a problem where many of us share his passion. Were this message to take hold, it could revolutionize Christianity today. The famine is real and the effects of the starvation are all around us. He gives insight to what happened to expository preaching. Entertainment and performance have run it out the church doors. Marketing techniques hold sway now. He opines how that the preaching of the cross that was once foolishness to the world now is to the church? This volume will fire you up and put you on the right track! He discusses “the criminal mishandling of God’s Word.” He not only espouses expository preaching, but comes hard at the gravity of getting off track. He hates spinning the text and reminds us to remember our audience of One. I particularly enjoyed his timely chapter on eisegesis. He defines it as “the reading of the text…of a meaning that is not supported by the grammar, syntax, lexical meanings, and over-all context, of the original.” Have you ever heard a sermon like that? Have you preached one? He covers several other such subjects. Mr. White can be overly harsh at times, and has written some other books that I have not cared for, but this one is a dandy. This volume tackles the thought of a pastor being a shepherd. 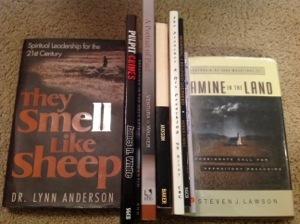 Focusing on our being shepherd, mentor, and equipper, he writes well. It is a worthy point of contemplation as the shepherd metaphor, he reminds, is in Scripture over 500 times. Though I wouldn’t agree with his theory of church polity, I love his title. While it might make you smile, you might learn along the way that to be a good shepherd you will end up smelling like a sheep too! Taking Paul’s ministry these two pastors identify “a true minister of Christ.” They don’t hide the suffering involved or the hardships endured, but they well describe the goal and strength of it too. This is an excellent read! In this interesting approach, Mr. Jackson talks about using the sermon as group therapy. We all deal with many things. A congregation will often cover all the bases in problems. There are sorrows and joys in life and we who preach the Word must take the Word and guide people through. This helpful volume gives guidance in preaching to things like the guilt-laden, the sorrowful, the fearful, the insecure, the lonely, the defeated, and many others. This book is well worth reading. An older volume by a well-respected Baptist pastor that gives basic counsel on sermons. A quick, easy read on basic principles of preaching. A real shot in the arm to keep us where we should be. The chapters are short, pointed, but wonderful. How about: “never be satisfied with your preaching”. There are practical points like not “hopping rapidly from verse to verse in the Bible.” He tells the danger of “abusing the use of humor in the pulpit.” Or even worse: “preaching ourselves instead of Christ.” There’s much more! A little volume that addresses the oft-forgotten, yet essential element in preaching–the power of the Holy Spirit! We so need this reminder. In this unusual volume that is two memorial sermons for James Alexander, we find real encouragement. It is good to think about what you would like said about you at the end of your ministry. It takes a certain kind of ministry to have it said with sincerity. Hodge began his sermon with Acts 9:20–“He preached Christ.” He then said, “Nothing higher than this can be said of any man. Angels stand uncovered round the humblest tomb on which these words are inscribed.” I can think of nothing I would rather have said, can you? I fell for it. Come to think of it, I have quite the bad record on that score. 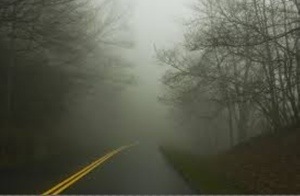 It was a dreary morning as I drove the curvy Tennessee roads early the other day. The fog hung heavy all around and it was as particularly dreary as I remember in a long time. Strangely enough, the physical conditions matched my disposition. It was as gloomy inside my head as it was out beyond my windshield. The day had no potential on any level. Every mile seemed more dreary than the one before. Funny to have in nature a metaphor of what was inside of me. The worst part was how hopeless it seemed. The day was bad and that was that–don’t even think it could be salvaged. Sometimes life can look the same way. Have you ever had a day like that? Life ever seemed that way too? Then I had a shock. I drove around a curve , and presto, the fog gave way to a burst of sunshine! The sky was that vivid blue of fall and the trees and fields were all that Tennessee is known for. It couldn’t have any more beautiful and gloom ran away like a frightened child. As I was thinking “wow”, it seemed an elbow nudged me. Then it hit me like a flash of lightening. I hadn’t heard the weather forecast and the day was actually to be a gorgeous one. It wasn’t that it was dreary and now it wasn’t. That wasn’t the lesson at all, though we often think that is the best we can hope for. Actually, it was a great day and it was just obscured from me. The day was wonderful, the sun was shining, and the outlook was really perfect. It was true and a little fog robbed me of it. Such is life, at least for one born into the family of God. There is fog no doubt. Plenty of it. The sun, though, shines on! My life has its fog, but that gloom is not the reality for me. The sun will burn the fog; the sun will defeat the fog; the sun will win! Fog can hide but it can’t change reality as it simply isn’t that powerful. For me there is Christ, Heaven, and forever! That is my reality and that is the lesson of the fog! This is not your father’s devotional! 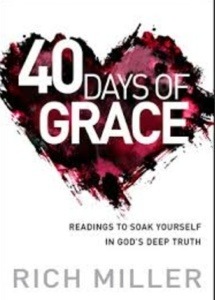 This volume by Rich Miller and published by Monarch Books takes you on a 40 day journey of grace. Grace is a treasure of the Christian life that is so often misunderstood, neglected, and overlooked. Its potential is transforming and sure, so the need is but to see it and take hold of it. Enter this volume as a real impetus to do so. His design is well thought out as grace is ever his theme while each week he takes an aspect like dealing with misplaced guilt, or humility, or the “grace-rest life.” The setup really works. He makes plain that there are two approaches to relating to God– impress Him and earn His love or relate in grace. He ever shows the futility and utter failure of such an approach as earning God’s love. It is a heavy, trying, and unfulfilling too. Grace opens a new, vibrant life with all the treasures of the Christian life. We need this discussion. I fear that most Christians are wrongly focused and are unhappy as their hearts yearn for God’s grace. Have no fear of an unbalanced, cheap grace here. He well correlates the need of the fear of God, or justice, or the reality of sin. In fact, it is that reality of sin that makes our need of grace so epic. By the end as he describes grace people, find your heart soaring in its desire to that person. May the Lord help us to be that person and I believe this book can help. I recommend it! Extra Note: My wife starting reading this book after I did and absolutely loves it! Among the many books written on the ministry, there are a few that simply have had a more enduring influence than others. Here are four titles that stand above the pack. Perhaps the most famous of the Yale Lectures and surprisingly good. Warren Wiersbe once said that “…every preacher ought to read (it) once a year for five years, and then once every other year for the rest of his life. What makes these lectures so valuable is that they deal with basic principles, not with transient methods. The preacher who is looking for shortcuts will not find them here.” Wiersbe was right! His explanation that preaching is truth through personality is classic and accurate. Jewels abound from start to finish in this volume. In advising us he said, “No man ever yet thought whether he was preaching well without weakening his sermon.” Later he was speaking on courage and said, “Courage is good everywhere, but it is necessary here. If you are afraid of men and a slave to their opinion, go and do something else.” He followed that with: “Be independent.” He also spoke of self-conceit and dealing with failure. Here is an example of another sparkling statement: “Failure and success to really working ministers are only relative. Remember that no man wholly succeeds or wholly fails.” I could go on and on! I could not follow Brooks in all his theology, but this volume could hardly be better. Another of the great Yale Lectures on Preaching is this powerful volume. Mr. Stalker took a different track than his predecessors by looking at the ministry through the ministries of Isaiah and Paul. He has many great things to say. For example, he said, “…the outer must be preceded by the inner; public life for God must be preceded by private life with God; unless God has first spoken to a man, it is vain for a man to attempt to speak for God.” He reminds us: “Preaching is not merely the speaking of a man. If it is, then it is certainly not worth coming to church for. Preaching, if it is of the right kind, is the voice of God.” He teaches us well. The idea is that we find our models in men in the Bible. It really works and this volume is a help. Subtitled “Paul’s Exultation In Preaching” and based on Paul’s statements in II Corinthians 2:12–6:10, this volume has been loved by many, especially Baptists. What is amazing is how well this volume doubles as a commentary on that section of Scripture in addition to being such a help to we who are in the ministry. He has so much to say that truly inspires. He tells us how essential our private walk with the Lord really is. He said, “The only way to have permanent glory is to continue beholding the glory of the Lord. If we cease looking at Him, we cease to reflect His glory.” That is a secret of ministry we need not miss! He writes powerfully about legalism and the “attraction of Christ.” He reminds us: “It is just because Jesus can save the worst of men that the preacher has the heart and hope to go on with his work.” On the other side he reminds too: “The vessel of clay is very fragile and is easily broken and destroyed.” He reminds us that the biggest portion of our pay comes in the next world. Pleasing our Lord is the passion of ministry, and we must never forget the Judgement Seat of Christ. He explains success in Paul. “God is the worker and Paul is the coworker. That is his glory and the secret of success in the ministry”, he says. I favor this volume over Stalker myself. It is a must-have volume. You wouldn’t think a book subtitled “Some New Testament Word Studies” would not be so gripping, but it is! It is a small book of barely over 100 pages, and only has 5 chapters, but what chapters they are. He discusses 5 roles the preacher fulfills according to the Scripture: steward, herald, witness, father, and servant. In those 5 things you have a great overview of the ministry. He lays it out so plainly, yet with power. In describing the steward and how he is not a prophet he says, “The essential characteristic of the prophet was neither that he foretold the future, nor that he interpreted the present activity of God, but that he spoke God’s word.” This alone would fix what ails the ministry in many circles today. There is so much more. This is another of the really great ones. I pray you can have your ministry blessed and in turn bless those to whom you minister by securing these volumes and mastering their contents! You can find all posts and books reviewed in this series here in the introductory post. It is hard to overestimate the value of a missions trip. I count my missions trips as some of the greatest experiences of my life. They so put the world and God’s plan in perspective. They almost always come with their unique set of adventures. What many never think of is what these trips could mean to our children. It seems what is valuable to us would be valuable to our children as well, perhaps only more so, since the earlier in our lives we learn this the better. 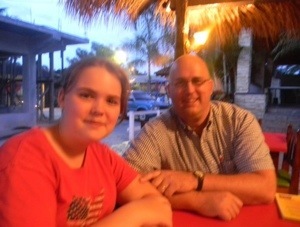 Two years ago I took my oldest daughter Briley with me to Honduras. What happened is hard to put in words–to her person, to her character, and even to our relationship. She had more terror than she wanted, but she will never be the same person! To get a feel of it, I will share an email I wrote to my wife Alicia when we came out of the remote mountains to the city with its Internet access again. We were cut off from the world in those mountains as there wasn’t even any electricity there. It was like another world! We had adventures that Briley still absolutely loves to talk about! A lot of this email will be about that wonderful girl that was the first baby we held in our arms. As a mother you may feel a little mixed emotions as I tell you about the last few days. I will say this first. Our little girl grew up a whole bunch and impressed everyone in the process. It all began Thursday moring as we drove an hour or so on nice roads. Briley begged me to let her ride in the back instead of the front. I gave in. Later the road got much worse. I wasn´t so scared as Bro. Delarca is a great driver and and I have been on jeep roads in the Smokies before. All seemed fine, but one scary moment. Bro. Delarca let the motor die and had trouble taking off and the back end started going sideways. A precarious dropoff was there that would have looked much worse from the truck bed. I knew my little girl was becoming terrified. I started praying for her. A little later Mike (Pastor friend Mike Montegomery) tapped on the window and said Briley was sick. I jumped out and took her 20 feet or so away from the truck and hugged and reassured her. She said she was blacking out from fear and cried only softly. I put Elijah (young preacher Elijah Grimm) in the front and practically held her the rest of the way. I wouldn´t let her look at the dropoffs and keep telling her this next spot wasn´t bad. We finally arrived and she held up so good while so scared. For the rest of the time she and I had often prayed that we could go back the easier way which required the river be down. She often asked about it and it was a fear she had to carry. Our quarters and bathroom were primitive. She really handled it well. She got into mean ants twice and has several bug bites. The amazing thing was how she would bouce back from every terror so well and be her pleasant self. I took care of her and never allowed myself to be out of her sight for a moment. We learned once when it was raining that Briley was not very scared at all in the truck cab, so I saw to it that she never was in the back of the truck again. From here on I was in the back instead. 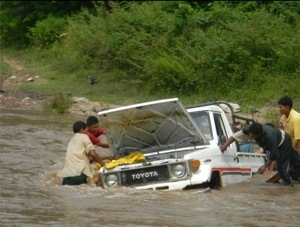 We went to a nearby village for church, about 20 minutes away over rough roads, but no dropoffs! Hondurans have a few peciliar features like knowing it´s going to rain and not leaving quickly to avoid it. We left with a truck full of people hanging on for dear life to go back to our village. It came a terrible cold mountain rain. I was soaked and cold and miserable. Briley was in the front where I saw to it she would be. Just before we left, a man opened Briley´s door and handed her a baby about 6 months old or so. I was panicked! How could Briley hold that baby with the truck jostleing around so. When we arrived, I learned that Briley had paid no attention to the mud or rain or driving but held that baby so well she put her to sleep! I was strutting like a rooster. That was my girl! The preacher lived about a mile away from the church where we stayed and one hill with deep ruts had to be gone over each time. Usually it wasn´t bad but the first evening it rained as we went and this was the first day before Briley started riding in the front. Actually this was the straw that broke the camel’s back that required that Briley ride in the front from then on. I was standing holding the rail when a rock about 2 feet wide rolled in the gully and caused us to stop. It was hard to get over it and so Bro. Delarca had to gun the motor! I was thrown down hard and my thigh hit the tirewell. It hurt terribly and I was afraid I had bone damage. I couldn´t let Briley know as that scared her to death for me. I had trouble with it for 2 days and then it got better. There´s more things for me but it got better for Briley. My mat went flat, we went and cut wood for the preachers, and I had to ride high on top of the wood on the truck. Briley was fine then. She and I prayed together every morning and evening and anytime she was scared. Mike has told me repeatedly that he was so impressed with Briley. She rode much with Bro. Delarca (an outstanding veteran missionary)and he said he would remember her the rest of his life. Briley talks much about the river. She doesn’t exaggerate. 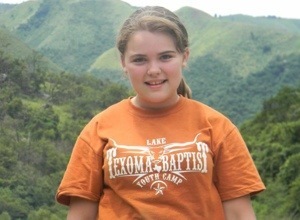 We first thrilled that God had answered the prayer to spare Briley going back the scary way. Don´t think we had a perfect road though as it is relative. We had lumber, about 10 bags of beans, and 10 other people in the back. It wasn´t a comfortable ride! At the river we saw it was crossable but Bro. Delarca got too far down and got the truck hung up on a rock. I jumped off to push with the men but we couldn´t budge it. We realized we couldn´t move and would have to get to shore. I got around to Briley who had water up to her waist but was not in danger of drowning as we were stationary. (I later learned she thought she might). Another man already had her door open as they are faster in the water than me. I grabbed her and walked her to shore. Fortunately the current was much worse at the rear of the truck than where she had to walk. I explained that we were safe and in no danger now. She was recovered after about 10 minutes but every time we men were called back in to push the truck she was afraid I would die. I am touched about her concern for me. We were there for hours and had to be hauled home in another truck. She found a little side creek fully in my view. I told her that I knew what she was doing and she said she was finding something good in something bad. The ride home was much worse for me than her. I secured her a seat in the front and we all rode in the back under a piece of plastic like a can of sardines. It was a smaller truck and was a 2 and 1-2 hour drive. One of the Honuran ladies vomited several times, so it could have been worse. We had services on the river as we waited for help to come. Mike and I both preached. BTW, the Lord especially helped me preach at that time. We finally got back in Yoro. The rest of the trip was much calmer, but we had such enjoyable services with several congregations. Missions trips are life changing, for you and your children, so why you start planning one now.